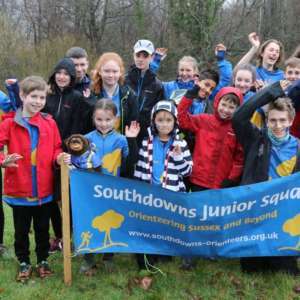 The Southdowns Junior Squad is the junior section of Southdowns Orienteers. The squad was formed in September 2013 and has members ranging in age from 6 to 20 years. The aims of the junior squad are to have fun in the great outdoors and to be a successful athletics club. If you are new to the sport of orienteering take a look at our NEWCOMERS pages where you'll find loads of handy tips to get you started. Thirty of our junior members took part in the south east heat of the Yvette Baker Trophy competition. They competed on yellow, orange, light green and green courses. They won by 8 points over closest rivals Guildford Orienteers. Congratulations to Scarlet Heap W16,Tommy Heap M14 and Jonny Crickmore M21 on their recent selection to represent England at the Interland competition being held in France in March. A huge well done! It was the Junior Inter-Regional Championships (JIRC's) on 29th and 30th Sept 2018 with Individual Races at Chatsworth House and Relays at Carsington Pastures. SO have a number of juniors in the South East Junior Squad (SEJS) - Amelia, Maddie, Sam, Stanley, Ffion, Scarlet & Tommy and they all helped the team to an amazing 4th place. The best result since 2006!